ORIENTATION: In work and organisational psychology, the adverse effects of job demands have often been demonstrated empirically for various indicators of job strain. RESEARCH PURPOSE: Using the Job Demands-Resources (JD-R) model as a theoretical framework, the present study examined the role of compassion satisfaction, conceptualised as a personal resource, in buffering the relationship between job demands and job strain. MOTIVATION FOR THE STUDY: Accordingly, four demanding aspects of the job (i.e. role overload, insufficiency, ambiguity and conflict) and one personal resource (i.e. compassion satisfaction) were used to test the central hypothesis that the interaction between (high) job demands and (low) personal resources produces the highest levels of anxiety and depression as indicators of job strain. RESEARCH DESIGN, APPROACH AND METHOD: Hypotheses were tested amongst 122 military chaplains. MAIN FINDINGS: Results showed that compassion satisfaction partially moderated the relationship between job demands and job strain. More specifically, when compassion satisfaction was high, the effect of role overload on job strain was significantly reduced. However, the relationships between the other three role stressors and job strain were not offset by compassion satisfaction. PRACTICAL/MANAGERIAL IMPLICATIONS: The theoretical and practical implications of these findings for the JD-R model are discussed. CONTRIBUTION/VALUE-ADD: Despite the limitations of this study, the present findings still have important implications for future research and practice. Our findings highlight the fact that the empowerment of employees' personal resources, as outlined in the JD-R model, may not only be of value for employees to thrive, but may also be particularly beneficial in terms of compassion satisfaction being viewed as a protective factor to adverse working conditions. During the past decades, many studies have shown that certain job demands - the most common type being the stressors pertaining to one's roles (Lambert, Hogan, Paoline, & Clarke, 2005) - can have a profound influence on employee well-being and work-related outcomes (e.g. work engagement, emotional exhaustion and intentions to leave; Doi, 2005; Halbesleben & Buckley, 2004). In work and organisational psychology, the detrimental effects of high job demands have been demonstrated empirically for a variety of adverse organisational and behavioral outcomes, including reduced job performance (Lang, Thomas, Bliese & Adler, 2007) and counterproductive work behaviours (Marcus & Schuler, 2004). Moreover, high job demands have been associated with various indicators of job strain, such as anxiety and depressive symptoms (e.g. Diestel & Klaus-Helmut, 2009; Griffin, Greiner, Stansfeld & Marmot, 2007). In spite of this large body of evidence, which has been supported for most employees (Snow, Swan, Raghavan, Connell & Klein, 2003) and clergy-related personnel in particular (Hang-yue, Foley, & Loi, 2005), it has been argued that the link from high job demands to job strain may be buffered by certain job resources (Bakker & Demerouti, 2007; Bakker, Demerouti & Euwema, 2005; Diestel & Klaus-Helmut, 2009). As a consequence, the purpose of the present study is to expand the Job Demands-Resources model (JD-R model; Bakker, Demerouti, De Boer & Schaufeli, 2003) by providing evidence that personal resources can moderate the relationship between job demands and job strain. In particular, it is argued that compassion satisfaction, a personal resource that has received insufficient theoretical and empirical attention, buffers the relationship between job demands (i.e. role stressors) and indicators of job strain (i.e. anxiety and depression). A second assumption in the JD-R model is that job strain develops when certain job demands are high and when certain job resources are limited (Demerouti et al., 2001). Previous studies conducted in a variety of organisations (e.g. Bakker, Demerouti, & Schaufeli, 2003; Bakker, Demerouti & Verbeke, 2004), have confirmed this hypothesis by showing that high job demands lead to employees' health problems (i.e. health impairment process), whereas the presence of job resources facilitate employees' motivation (i.e. motivational process). Two different underlying psychological processes are thus believed to play a crucial role in the development of job strain. In the first process, chronic job demands (e.g. work overload) may lead to long-term job strain. The second process is motivation-based in that job resources are viewed as having a strong motivational potential (Hackman & Oldman 1980), which lead to high work engagement, low cynicism and excellent performance. Richter and Hacker (1998) further sub-devised the job resources in two categories, namely external resources (i.e. organisational and social) and internal resources (i.e. cognitive features and action patterns). Within the framework of the JD-R model, although the focus has been on the main effects of job demands and job resources, theoretically, it could be argued that it is the interaction between job demands and job resources that is most crucial in the development of job strain and motivation (Bakker et al., 2005; Bakker, Demerouti, Taris, Schaufeli & Schreurs, 2003). As a result, the third assumption in the JD-R model is that job resources may buffer the influence of job demands on stress reactions. Conceptually, a buffer is a variable that alters (i.e. moderates) the direction or strength of the relationship between two other variables (see Baron & Kenny, 1986). Accordingly, under demanding work conditions, employees who are provided with sufficient job resources are said to be more capable of dealing with these job-related demands. As a result, they experience lower levels of exhaustion (Bakker et al., 2005). Although studies on the JD-R model have focused largely on work characteristics (Xanthopoulou, Bakker, Demerouti, & Schaufeli, 2007), the recent addition of personal resources into the model is a significant contribution. Personal resources, a type of resource that is commonly associated with resiliency, refers to people's self-evaluations that enable them to control and influence their environment (Hobfoll, Jonshon, Ennis, & Jackson, 2003). Simply stated, it has been argued that without the presence of these personal resources, the various job demands can easily create negativity leading to the development of signs associated with depression, job strain (Radey & Figley, 2007) and symptoms that are similar to post-traumatic stress disorder (Stamm, 2009). A closer view of the research on personal resources in the organisational literature, however, yields conflicting evidence regarding the role of personal resources as moderators. On the one hand, some researchers have found that some personal resources, namely self-efficacy, organisational-based self-esteem (OBSE) and optimism, have the potential to buffer the relationship between job demands on the one hand and health-related and organisational outcomes on the other. For instance, Jex and Elacqua (1999) found that OBSE moderated the relationship between role ambiguity and two adverse behavioural outcomes, namely depression and physical strain. Likewise, other researchers found that self-efficacy moderated the relationship between job demands and health-related outcomes (Van Yperen & Snijders, 2000). Some other scholars have found that optimism moderates the relationship between work stressors and mental distress (Mäkikangas & Kinnunen, 2003). However, other researchers have found that personal resources do not buffer the relationship between job demands and organisational and health-related outcomes. For example, Xanthopoulou and colleagues (2007) did not find that self-efficacy, OBSE and optimism moderated the relationship between job demands and exhaustion. They found instead, that personal resources functioned as mediators between job resources and exhaustion or engagement. More research is needed to better understand the moderating role of personal resources as it applies to the JD-R model. To further investigate the role of personal resources in the JD-R model, the present study uses insights from the literature on compassion fatigue, with an emphasis on the construct of compassion satisfaction (Stamm, 2005). In line with the motivational role of the personal resources, as outlined in the JD-R model, compassion satisfaction is defined as the fulfillment professional caregivers - social workers, firefighters and clergy alike (Stamm, 2002) - feel from helping those who have experienced a traumatic event (Stamm, 2005). Compassion satisfaction thus highlights the positive aspects of helping others. Historically, this area of research arose from the one on compassion fatigue, which tends to concentrate on the negative aspects of helping others. Compassion fatigue, a term popularised by Figley (1995, 2002), refers to professional caregivers who experience symptoms similar to post-traumatic stress disorder as a consequence of listening to the traumatic events experienced by others (i.e. indirect exposure). Because not all professional caregivers experience compassion fatigue, it has been asserted that some of them must have a protective factor (i.e. compassion satisfaction) that helps shield them from being traumatised indirectly. Specifically, it is argued that compassion satisfaction protects professional caregivers from the negative aspects associated with helping others. Although there are numerous publications on compassion fatigue and related constructs, such as secondary traumatic stress (Jenkins & Baird, 2002), secondary trauma (Figley, 1983) and vicarious traumatisation (McCann & Pearlman, 1990), there is surprisingly little published research on compassion satisfaction. Of the existing research, numerous studies have primarily sought to understand how the two constructs apply to different occupational groups (e.g. Van Hook & Rothenberg, 2009; Jacobson, 2006). For example, Conrad and Kellar-Guenther (2006) found that Colorado child protection workers showed moderate levels of compassion satisfaction and were at risk for compassion fatigue. Researchers have also sought to understand the pattern of relationships between compassion satisfaction and compassion fatigue. For instance, researchers have found that higher levels of compassion satisfaction were associated with lower levels of compassion fatigue (Ortlepp & Friedman, 2002; Sprang, Clark & Whitt-Woosley, 2007). Other researchers have extended compassion satisfaction research by studying the relationship between compassion satisfaction and other psychosocial variables. For instance, Cicognani and colleagues (Cicognani, Pietrantoni, Palestini, & Prati, 2009) found that higher levels of compassion satisfaction were positively associated with higher self-efficacy beliefs, sense of community and constructive coping strategies. High compassion satisfaction has also been argued to result from seeing one's job as a calling in which individuals believe that they were meant to do a certain job despite the adversity they may encounter (Friedman, 2002). In this way, being a member of the Chaplaincy may be viewed as a calling rather than simply an occupation (see Zickar, Balzer, Aziz & Wryobeck, 2008). Although there are some published studies on compassion satisfaction, the research is mostly limited to journals that emphasise its practical applications to the topics of counselling and therapy. There is a dearth of research that examines the organisational implications of compassion satisfaction. From a workplace perspective, the job demand of resolving (or solving) the stressors causing somebody else's distress can easily lead to signs related to job stress, depression (Radley & Figley, 2007) and symptoms similar to post-traumatic stress disorder (Stamm, 2009) for professional caregivers who experience low levels of compassion satisfaction. Compassion satisfaction is thus believed to be especially important in this context because it can potentially have positive ramifications on individual and organisational outcomes (Messervey & Suurd, in press), such as buffering the relationship between high job demands and experiences of job strain. Although job strain is said to develop irrespective of the type of job (Bakker et al., 2003), it seems as if every occupation has its own specific risk factors (Bakker & Demerouti, 2007). More specifically, employees in 'caring' occupations are considered to be highly susceptible to job strain, because they are regularly confronted with demanding patients, who often show little appreciation for the care they receive (Bakker, Kilmer, Siegrist, & Schaufeli, 2000). Moreover, caring professionals, such as clergy, may experience the emotional and/or spiritual distress of those with whom they work (Roberts, Flannelly, Weaver & Figley, 2003). Military chaplains are no exception to this rule. Military chaplains face a myriad of challenges and responsibilities that most professional caregivers do not. One distinctive aspect of being a military chaplain is that they must serve the well-being of all instead of members of their own faith group. Thus, a Roman Catholic military chaplain may provide care and support to Muslim soldiers. Moreover, in addition to being chaplains, they are also military members, which means that they are part of the military rank structure (e.g. Major, Colonel) and receive specialised training (e.g. basic operational skills). Thus, whereas civilian chaplains do not typically give formal guidance to government officials, military chaplains may also be asked to give spiritual and moral guidance to senior military officers. As a result of providing direct care after critical incidents, military chaplains can experience frequent, repetitive and cumulative exposure to trauma and high levels of extreme stress (Roberts, Flannelly, Weaver & Figley, 2003). In fact, front-line health and religious professionals were found more likely to suffer from secondary psychological trauma or compassion fatigue (Figley, 2002). This led to the belief that anxiety and depression are especially important to study in this context as these indicators of job strain (Griffin, Greiner, Stansfeld & Marmot, 2007) can potentially help flag individuals at risk of post-traumatic stress disorder. In investigating occupational stress and burnout, Marsh (2003) also found that there were differences in the sources and levels of vocational, psychological, interpersonal and physical strain experienced by health care and military chaplains. Empirical support for the buffering role of personal resources in this context is thus believed to be crucial both theoretically (i.e. enhance understanding of the factors that lead to job strain) and practically (i.e. job strain prevention). To date, there is a need for a better understanding of the role of personal resources in the JD-R model. By definition, personal resources act as buffers of the effect of job demands on job strain (Bakker & Demerouti, 2007). The combination of high job demands and high personal resources represents the buffer effect and suggests that despite working under demanding conditions, high levels of personal resources may prevent the occurrence of job strain. Not only is there a shortage of research that examines the role of personal resources, there are also discrepancies in the reported research findings. Whereas some researchers have found that personal resources moderate the relationship between job demands and employee well-being (Jex & Elacqua, 1999; Van Yperen & Snijders, 2000), other researchers have failed to find such effects (Xanthopoulou et al., 2007). Moreover, most personal resources as applied to the JD-R model have focused on three main moderators, namely OBSE, optimism and self-efficacy. The present study thus expands the literature by investigating a previously under-researched personal resource, namely compassion satisfaction (Stamm, 2005). The central question of the present study is thus whether the specific personal resource of compassion satisfaction can buffer those specific job demands that are considered strain-inducing for military chaplains. Accordingly, the relationship between role stressors and job strain should be particularly strong when personal resources are low (see Figure 1 for a graphical representation). Compassion satisfaction will moderate the relationship between four job demands (i.e. role overload, ambiguity, insufficiency and conflict) and job strain indicators (i.e. anxiety and depression). That is, role stressors will be positively associated with job strain when compassion satisfaction is low as compared to when compassion satisfaction is high. One hundred and twenty-two chaplains (89.7% male and 10.3% female) working in a military environment completed a battery of scales as part of a Branch-wide organisational assessment, including role stressors, compassion satisfaction and job strain. Participation was voluntary and in accordance with the American Psychological Association guidelines. Participants had the option to complete, in the language of their choice, either an electronic version or a paper-based format (less than 5%) of the questionnaire. Participants were also informed that their responses would be treated confidentially. Most participants were Regular Force members (83.6%), whereas 16.4% were Primary Reserve members or civilians. Participants indicated a range of years of service, in which 31.9% served less than 5 years, 30.2% served 5-15 years, 29.4% served 16-25 years and 8.4% served over 26 years. All participants reported belonging to a particular faith group: Protestant (63.9%), Roman/Eastern Catholic (30.3%) and Jewish or Muslim (5.7%). The majority of participants (64.9%) identified themselves as being in the 36-50 age range (ranging from 26 to 51 years). Regarding language, 82.8% completed the survey in English and 17.2% completed the survey in French1. Role Stressors: An adapted version of the OES-Form E2 (Osipow & Spokane, 1983), which measures employees' perceptions of stressors in their occupational environment stemming from social interactions at work, was used. Accordingly, Woycheshin's (2007) 3-item per factor version of the OES was used, which included a total of 15 Likert-type items that range from 1 ('rarely or never') to 5 ('most of the time') (see also Tremblay, 2009). Role overload assesses the stress associated with having too much work to carry out in the time given (e.g. 'At work I am expected to do many different tasks in too little time'; α = 0.84). Role insufficiency assesses whether individuals perceive their work as unchallenging and their future career prospects as discouraging (e.g. 'My talents are being used in my work' - reverse coded; α = 0.83). Role ambiguity assesses the extent to which performance criteria are unclear (i.e. 'The priorities of my work are clear to me' - reverse scored; α = 0.58). Role conflict assesses the degree to which individuals feel that they encounter competing demands and loyalties in the workplace (e.g. 'My supervisors have conflicting ideas about what I should be doing'; α = 0.82). For the purposes of this study, given that only 30% of respondents reported being responsible for subordinates, the role responsibility for others subdimension was omitted from all subsequent analyses. Although, to date, a reliability of 0.70 or higher is recommended, on the basis of Nunally's argument (1967) that reliability levels ranging from 0.50 to 0.60 are legitimate, the internal consistencies of the four subdimensions in the present study were deemed acceptable, with Cronbach alphas ranging from 0.58 to 0.90. Compassion Satisfaction: The ProQOL R-IV (Stamm, 2002; 2005) is a 30-item scale that is comprised of three subdimensions: compassion fatigue (also referred to as secondary trauma), compassion satisfaction and burnout. For the purposes of this study, only the compassion satisfaction subdimension was included in the analysis, which assesses the degree to which professional caregivers feel a sense of satisfaction in performing their work well (e.g. 'I get satisfaction from being able to help people' and 'I am proud of what I can do to help'). The compassion satisfaction subscale contains 10 items that are rated on a 6-point Likert-type scale that ranges from 0 ('never') to 5 ('very often'). Respondents were asked to indicate how frequently they experienced the characteristics described in each item in the 'last 30 days'. Responses were summed prior to interpretation. A Cronbach alpha of 0.88 for the compassion satisfaction subdimension has been previously reported (Stamm, 2009) and was equal to 0.90 for the present study. Job Strain: The 10-item Kessler Psychological Distress Scale (K10; Kessler Andrews, Colpe, Hiripi, Mroczek, Normand, Walters, & Zaslavsky, 2002) was used to measure job strain (α = 0.89). In line with the common presentation of job strain results in terms of risk categories (i.e. low or no risk to high risk; see Kessler et al., 2002 and Tremblay, 2009), responses to the individual items were averaged together. This measure uses a 5-point Likert-type scale ranging from 1 ('none of the time') to 5 ('all of the time'). Sample items include: (In the last four weeks ...) 'Did you feel tired-out for no good reason?' (i.e. depression subdimension) and 'Did you feel restless or fidgety?' (i.e. anxiety subdimension). The scale was coded such that higher scores reflected higher job strain. The internal consistency of the job strain scale in the present study was equal to 0.90. To provide empirical support that the two job strain subdimensions can be treated as one factor, an exploratory factor analysis (EFA; principal component extraction and oblimin rotation) was conducted. The EFA revealed a 1-factor solution (eigenvalue greater than 1.0; Pett, Lackey, & Sullivan, 2003), suggesting that the subdimensions of depression and anxiety could be treated as one factor. Prior to analyses, all variables were examined for accuracy of data entry, missing values and fit between their distributions and assumptions for multivariate analyses (Tabachnick & Fidell, 2001). All variables were deemed normally distributed. However, at the univariate level, one respondent had a standardised score above three standard deviations on the job strain variable and was omitted from all subsequent analyses. Similarly, another respondent had a standardised score below three standard deviations on role ambiguity and was not included in analyses involving role ambiguity. Although two civilians participated in this study, they were also removed from the analyses in order to have a homogeneous military sample. Descriptive statistics and intercorrelations of all measured variables are presented in Table 1. An exploratory factor analysis (EFA) including all independent variables was performed to demonstrate that the studied variables could be empirically discriminated. Using an oblique rotation, this EFA (maximum likelihood extraction) revealed five main factors (eigenvalues greater than 1; Pett, Lackey & Sullivan, 2003), with 10 items serving as indicators of 'compassion satisfaction' (29.9% of variance explained), 3 items serving as indicators of 'role overload' (13.7% of variance explained), 3 items serving as indicators of 'role insufficiency' (10.6% of variance explained), 3 items serving as indicators of 'role conflict' (6.3% of variance explained) and 3 items serving as indicators of 'role ambiguity' (6.0% of variance explained). All 22 items had loadings greater than 0.30 (Tabachnick & Fidell, 2001) and only 6 items loaded on more than one factor (i.e. crossloadings, three of which were the role ambiguity items). The Harman's Single-Factor Test for assessing common-method-variance (Podsakoff et al., 2003) was also performed using exploratory factor analysis (principal components extraction) and revealed a total of 7 factors (eigenvalues greater than 1; Pett, Lackey & Sullivan, 2003), four of which accounted for more than 5% (Podsakoff & Organ, 1986) of the unique variance explained (i.e. job strain, compassion satisfaction, role overload and role insufficiency). It was thus assumed that the present dataset was not subjected to common-method variance. Our central hypothesis was that role stressors and compassion satisfaction would be associated with higher levels of job strain when compassion satisfaction is low as compared to when compassion satisfaction is high. A total of four 4-step moderated hierarchical regressions were conducted to test the unique and combined effects of role stressors and compassion satisfaction on job strain. At Step 1, demographic variables (i.e. gender, rank, age, years of service and religion) were entered into the regression to control for their respective effects. The role stressors (i.e. role overload, insufficiency, ambiguity and conflict, respectively) were entered into the equation at Step 2. At Step 3, the moderator variable of compassion satisfaction was entered. Lastly, providing a test of the central hypothesis, the interaction terms between the role stressors and compassion satisfaction were entered at Step 4 (total of four interaction terms). After each step, the amount of additional explained variance was assessed. Prior to these analyses, the predictors and the moderator were centralised to reduce multicollinearity ( Aiken & West, 1991). After controlling for the effects of the demographic variables (i.e. Step 1), the results of Step 2 revealed a main effect of role overload, in that higher levels of role overload were related to greater job strain (β = 0.37; R2 change = 0.13, F[1, 105] = 15.32, p = 0.001). At Step 3, the addition of the moderator variable to the equation also revealed a main effect, in that compassion satisfaction predicted job strain over and above the unique contributions of the demographic variables and role overload (β = -0.32; R2 change = 0.09, F[1, 104] = 12.03, p < 0.01). More specifically, higher levels of compassion satisfaction were related to lower levels of job strain. As a test of the central hypothesis, the addition of the role overload X compassion satisfaction interaction term (i.e. Step 4), explained a statistically significant proportion of variance beyond that accounted for by the other predictors (i.e. control variables and main effects) in the model (β = -0.19; R2 change = 0.03, F[1, 103] = 4.57, p < 0.05). Subsequently, simple slopes analyses were conducted to determine the nature and directionality of the interaction (Aiken & West, 1991). Results revealed that amongst those with high levels of compassion satisfaction, higher levels of role overload were still associated with greater job strain (β = 0.22, t  = 2.07, p = 0.04). More importantly and giving partial support to the central hypothesis, at low levels of compassion satisfaction, this relationship was further augmented wherein higher levels of role overload were even more strongly related to job strain (β = 0.56, t  = 4.50, p < 0.001). 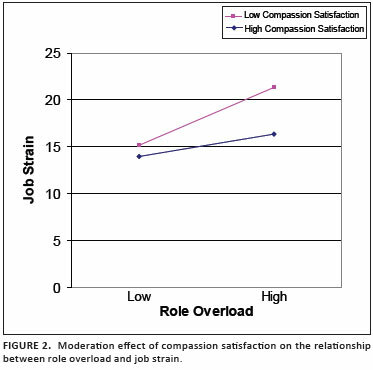 The moderation effect of compassion satisfaction on role overload and job strain is depicted in Figure 2. Moderated hierarchical regressions were also conducted to determine whether compassion satisfaction acts as a moderator in the relationship between the other three role stressors (i.e. role insufficiency, role ambiguity and role conflict) and job strain. Accordingly, at Step 4, the interaction terms of each respective regression analysis were expected to reach significance and account for unique variance in the model. Contrary to the central hypothesis, however, the relationship between the other role stressors and job strain was not buffered by compassion satisfaction. In particular, the role insufficiency X compassion satisfaction interaction term was not significant when entered into the last step of the equation (β = 0.03; R2 change = 0.001, F[1, 103] < 1, p = 0.78). Likewise, neither the role ambiguity X compassion satisfaction interaction term (β = 0.06; R2 change = 0.003, F[1, 102] < 1, p = 0.55) nor the role conflict X compassion satisfaction interaction term (β = -0.15; R2 change = 0.02, F[1, 103] = 3.13, p = 0.08) yielded significance. In consideration of all the facts about the quality of present-day working life, it becomes particularly important to find personal stress resistance resources that may modify the well-documented stressor-strain relationship. In recent research, it has become clear that the tendency to perceive job demands as stressful depends in part upon the characteristics and/or resources of the working individual (Mäkikangas & Kinnunen, 2003). For instance, workers exposed to the same environmental stressors may express remarkably different psychological, physical and behavioral reactions resulting from different personal attributes (see Kahn & Byosiere, 1992). Accordingly, the central aim of the present study was to test the buffering role of personal resources in the job stressors-strain relationship, as postulated by the JD-R model (Bakker & Demerouti, 2007), using a sample of military chaplains. Our findings provide partial support for the model's basic moderating assumption in that compassion satisfaction buffered the relationship between job demands and job strain. Consistent with the central hypothesis, it was found that role overload was associated with higher levels of job strain when compassion satisfaction was low as compared to when compassion satisfaction was high. Contrary to expectations, however, compassion satisfaction was not found to moderate the relationship between the other three role stressors (i.e. role conflict, role ambiguity and role insufficiency) and symptoms of anxiety and depression. The present study contributes to both the stress-buffering organisational literature as well as the compassion satisfaction literature by investigating whether compassion satisfaction can modify the impact of harmful work stressors on job strain. At the organisational level, it is important to determine what happens in terms of job strain when job demands are at an elevated level and personal resources are relatively low. By shedding light on this question, the present study has implications for the refinement of the JD-R model. Primarily, it further specifies the various functions of personal resources within the JD-R framework. It has been argued that personal resources may influence stress reactions by either acting as a mediator (Xanthopoulou et al., 2007) or by moderating the relationship between work stressors and employees' stress reactions (Mäkikangas & Kinnunen, 2003). Although Xanthopoulou and colleagues (Xanthopoulou et al., 2007) have failed to support the moderating properties of personal resources, our study successfully showed that - in addition to such main effects - the interaction between job demands and compassion satisfaction explains a unique proportion of the variance in job strain. Such an effect is consistent with the few previous studies that found support for the moderating role of a limited number of personal resources (e.g. self-efficacy, OBSE and optimism, see Mäkikangas & Kinnunen, 2003; Pierce & Garner, 2004; Van Yperen & Snijders, 2000). The present study also further specifies the particularities of the compassion satisfaction construct. To date, the primary focus of the compassion satisfaction literature has mainly been to identify occupational groups that have the potential to experience compassion satisfaction and to understand how compassion satisfaction is related to the constructs of compassion fatigue. To the best of our knowledge, apart from Stamm's argument (2002) that compassion satisfaction may play a critical role in reducing compassion fatigue and mitigating symptoms of burnout, this is the first published study that illustrates an empirical link between compassion satisfaction and job strain in an organisational setting. The present study thus extends the existing literature by illustrating that those working individuals who believe that they will not be able to accomplish expected workloads (i.e. high role overload; Osipow & Davis, 1998) are more likely to experience job strain when their personal level of compassion satisfaction is low and are less likely to experience job strain when their personal level of compassion satisfaction is high. Although it has been argued that job resources largely predict work engagement (i.e. motivational process; Bakker, Hakanen, Demerouti & Xanthopoulou, 2007), previous studies in the context of the JD-R model that concerned the role of job resources in the prevention of job strain mainly emphasised their moderating potential in the model's health impairment process (Bakker, Demerouti & Euwema, 2005). In line with this approach, it could be argued that job resources are thus mainly negatively associated with job strain. However, in a study by Xanthopoulou et al. (2007), autonomy (conceptualised as a job resource) was not found to buffer the effect of workload on indicators of job strain. Interestingly, our findings suggest that it is personal resources that seem to play an active role in the prevention of job strain (i.e. health impairment process). In particular, although individuals may have no power over their workloads, those who experienced high levels of compassion satisfaction felt more capable to perform their tasks and as a result, were unlikely to become overly anxious and depressed. This finding is consistent with Frederickson's view (1998) relating to the importance of personal resources in the promotion of health and well-being. Although these results are promising, the relative importance of personal resources as compared to job resources in regards to the model's dual processes is certainly an interesting line of research. That said, compassion satisfaction did not buffer the effect of the other three role stressors (i.e. role insufficiency, ambiguity and conflict) on anxiety and depression. Several reasons may account for these results. Firstly, the obtained findings could be explained, in part, by the complex nature of the military setting. For instance, whilst deployed on operational missions (Krueger, 2006), military personnel often have to perform in high-tempo situations (Eccles, 2008). This reality is no different for military chaplains and is highly consistent with the definition of role overload. According to Osipow and Davis (1998), role overload evokes an imbalance between job demands and resources, resulting in a fear of not being able to accomplish expected workloads. To that effect, at the descriptive level, the main source of stress reported by chaplains in the present sample was indeed role overload, followed by conflicting demands. It may result that the military chaplains who participated in this study felt highly prepared to face the realities of their jobs (i.e. role insufficiency) and were fully aware of priorities and expectations (i.e. role ambiguity). Secondly, it is possible that other personal resources may be at play in the stress-strain relationship. For example, some researchers have found that self-efficacy and locus of control buffers the relationship between some role stressors (e.g. role overload) and indicators of job strain (Matsui & Onglatco, 1992; Rahim, 1997). Opportunity stress (e.g. role insufficiency) is a condition where an individual has the potential to gain something that is considered desirable. Constraint stress (e.g. role conflict and role ambiguity) is a situation where personal desires may be thwarted. Demand stress (e.g. role overload) is a condition where an individual has the potential to lose something that is deemed important. It is thus possible that compassion satisfaction only buffers the relationship between demand stressors (e.g. role overload) and job strain but not the other types of organisational stressors (i.e. opportunity and constraint). More research further investigating these results is warranted. Nonetheless, the results of the present study have practical importance because organisations may wish to reduce job strain by fostering compassion satisfaction. Clearly, there is an aspect of compassion satisfaction that is compelling (Stamm, 2002) to helping professionals. They often not only join the profession 'to help others' and 'to make a difference', but often report being glad they could help (Radey & Figley, 2007). Compassion satisfaction thus appears to be linked to one's professional quality of life, in which the act of feeling compassionate enables one to thrive and allows the individual to maintain career enthusiasm (Radey & Figley, 2007). Although the present study has a leading role in establishing how compassion satisfaction can buffer the association between role stressors and job strain by suggesting that employees who experience compassion satisfaction might be more resistant to adverse working conditions (see also Xanthopoulou, Bakker, Dollard, Demerouti, Schaufeli, Taris & Schreurs, 2007), more research is clearly needed to fully understand how to bolster compassion satisfaction in the workplace. The contributions of this study should be interpreted in light of its limitations. The main limitation is its cross-sectional nature, which excludes any causal inferences regarding the relationships tested. Although the classical hypotheses that job demands predict job strain (i.e. health impairment process) and that resources (job and personal) predict motivation (i.e. motivational process) represent conventional pathways and have been confirmed by several studies (including longitudinal ones; Buunk, De Jonge, Ybema & De Wolff, 1998), recent studies also provide evidence for its reverse causal relationships. Future studies should further examine the longitudinal effects of job demands-resources interactions on job strain and should also aim to incorporate reversed causal relationships. Furthermore, the present study was exclusively based on self-report measures that might lead to common method variance problems. That said, compassion satisfaction did not show significant correlations with some of the studied variables (mainly the role stressors) and the Harman's Single-Factor Test was not significant, suggesting that common method variance may not have been a problem. Regardless, although it can be argued that such constructs as personal resources and job strain are nearly impossible to measure in any other way other than by self-reports (Mäkikangas, Kinnunen & Feldt, 2004), it is crucial for the development of the field of organisational psychology to include more objective measures (e.g. observers' ratings, health indicators). For instance, differences in the strength of the referred relationships between self-reports and observers' ratings have been interpreted as indication that the two sources might not measure exactly the same qualities (Demerouti et al., 2001). Another drawback is that the results of the present study concern a rather specific and homogenous group (i.e. military chaplains). Because the specific job demands may vary across organisations (Demerouti et al., 2001), further studies on the buffering hypothesis of the JD-R model in different occupational settings are needed in order to strengthen our findings. Based on the present results as well as on previous studies with the same scope (e.g. Xanthopoulou et al., 2007), we expect that the buffering hypothesis will generally be supported, but perhaps for different job demands, depending on the occupational setting. It is still important to further test the external validity of our findings for other working populations, even though our findings confirmed results of earlier studies and hypotheses that are firmly rooted in theory. In addition, the moderator findings must also be considered in the light of statistical issues. Although there were significant interactions between personal resources and job demands on job strain (i.e. compassion satisfaction with role overload), these effects were quite small and explained less than 5% of the variance in the job strain indicators after controlling for the main effects. To that effect, however, both McClelland and Judd (1993) and Parkes (1994) have noted that moderator effects are difficult to detect and that even 1% contribution of the total variance should be taken into consideration. The moderator effects were especially difficult to detect herein, because of the strong main effects as well as our limited sample size (i.e. low statistical power). Due to this fact, these significant results should be considered particularly noteworthy, because they shed light on the combination of different working conditions - the empowerment role of personal resources in particular - that may lessen symptoms of job strain. A final limitation of the present study is that it included a limited number of dependent variables, namely only the two indicators of job strain. As previously mentioned by Bakker, Demerouti and Euwema (2005), it would seem important to examine the applicability of the JD-R model for different sets of dependent variables in future research, such as organisational commitment, engagement and turnover intentions (see e.g. Bakker, Van Veldhoven & Xanthopoulou, 2010). Despite the limitations of this study, the present findings still have important implications for future research and practice. Our findings highlight the fact that the empowerment of employees' personal resources, as outlined in the JD-R model, may not only be of value for employees to thrive (Xanthopoulou et al., 2007), but may also be particularly beneficial in terms of compassion satisfaction being viewed as a protective factor to adverse working conditions. However, the initial concern of organisations should still be to avoid overwhelming levels of job demands (role overload as one example) in order to promote employees' health and underlying motivations as these are the main predictors of job strain. If restriction of job demands is impossible, our results suggest that organisations should take appropriate steps to foster compassion satisfaction amongst their employees, in order to offset the negative effect of job demands on indicators of job strain. From a practical standpoint, this study highlights that strain interventions should focus on both personal and work-related characteristics. Compassion satisfaction should be seen as a particularly powerful personal resource because it influences what choices individuals make and what instruments they will use to cope in different working scenarios. Specifically, for jobs to be health promoting, organisations could cultivate supportive features to promote feelings of compassion satisfaction amongst employees. In line with this approach, the Certified Compassion Fatigue Specialist Training (Gentry, Baggerly & Baranowsky, 2004) has recently shown a clinically significant decrease in participants' compassion fatigue and burnout symptoms and increase in their compassion satisfaction. As a complement to a supportive working environment (viewed as a job resource), such training thus appears to be an effective intervention tool for reducing strain symptoms amongst helping professionals. To conclude, the present study is of importance to the development of job interventions that aim at maximising employee motivation and reducing maladaptive exhaustion, contributing to the development of a flourishing and healthy work environment, which may lead to more happiness at work and in life in general. 1. Independent T-tests revealed no significant differences on the basis of survey language on any of the studied variables.